Baker Creek sent my seeds a while back and I am super excited. 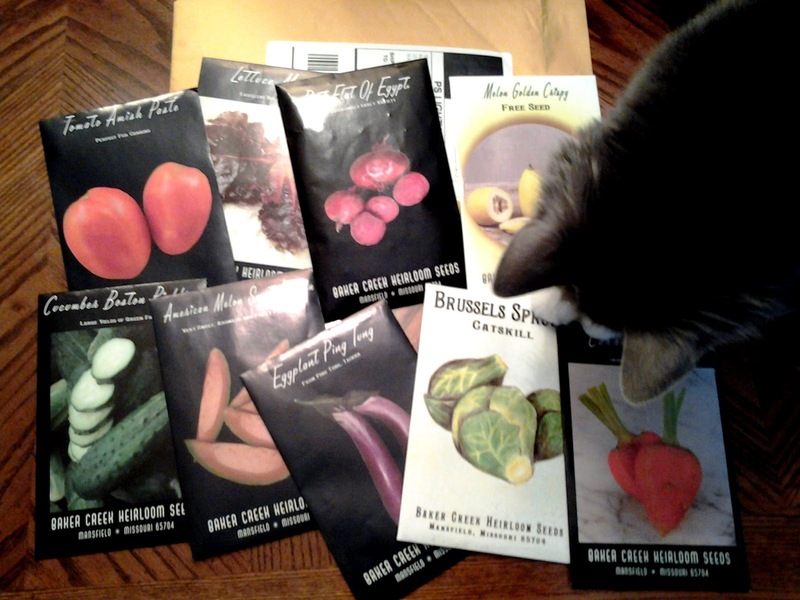 If you're going to buy seeds, buy quality seeds. They only sell 100% Non-GMO seeds which is incredibly important to me. That cat in the corner, is Chloe to Ninja Attack Cat...a.k.a. The Bear. She heard the packets shaking and tried to tear them open. I had to take this picture very quickly before she destroyed everything. Dogs are nice. Cats are insane. Just saying. I have my artichoke (I started them late again, ugh), tomato, pepper, eggplant, melon, and cucumber seeds started. I have to start the cabbage, broccoli and brussel sprouts...I never feel like I'm starting them at the right time. I am highly confused about growing them, but I'll keep trying anyway. The lettuce, carrots, beets and whatnot will be direct sowed, probably this weekend. First, we install the 7 ft deer fence, which will hopefully be the last garden fence we ever attempt. I love groundhogs. I just don't love them in my garden...sampling tomatoes and eating all the kale.